Welcome to another edition of No-Sew Sunday! 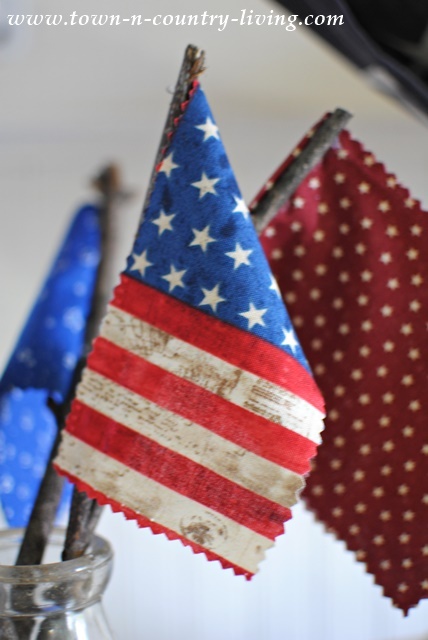 I’m joining a few other blogging friends to bring you patriotic projects you can do yourself … without having to do any sewing! Today is Flag Day so it seemed apropos to host a patriotic theme today. Join us the second Sunday of each month at 6 pm CT for a round of no-sew projects. 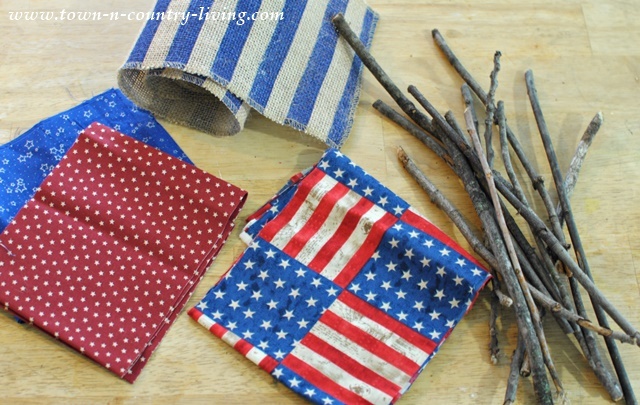 My project is super quick and easy and something you can use for the 4th of July. 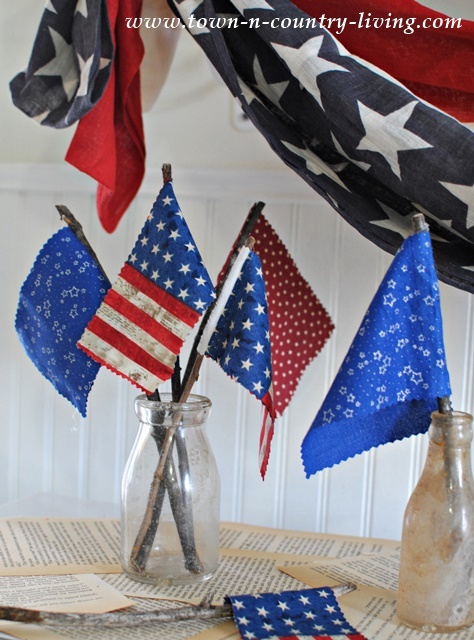 I made a set of DIY Mini Flags using sticks and patriotic fabric! We have Silver Maple trees in our yard and they’re always shedding branches so the sticks were easy to come by! I’d rather put them to good use than burn them or bag them up to be hauled away. I found a variety of patriotic fabrics from Hobby Lobby for a very low price. And of course, the sticks from the yard are free so this is a super inexpensive project. You might remember last year that I found similar flags at the store, but they were sewn onto the sticks. 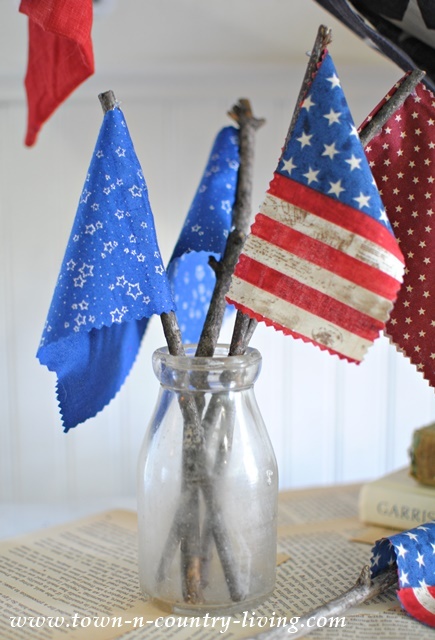 I vowed to make some of these DIY mini flags this year, but I figured … why not hot glue them instead of getting out the needle and thread? All you need is fabric swatches, sticks cut to size, pinking shears (or use regular scissors) and a hot glue gun. I used pinking shears to cut rectangles from the fabric because I wanted jagged edges. But you could certainly use scissors you have on hand. 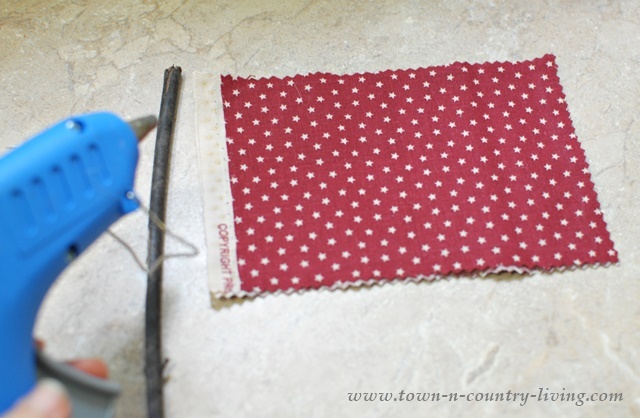 Then simply apply a line of hot glue along the top end of the stick, the length of the short end of the fabric. 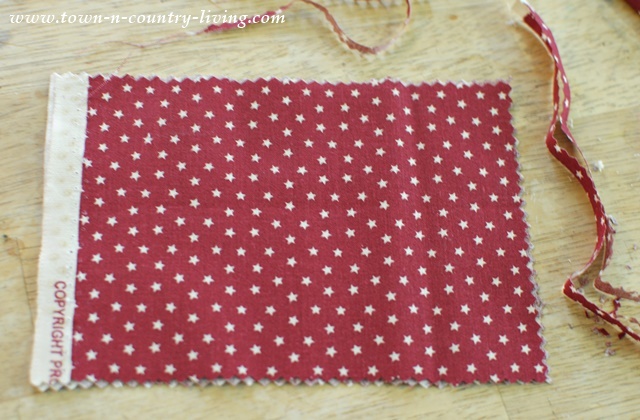 Then carefully press the short edge of fabric onto the stick and you’re done! Choose a few coordinating fabrics for a fun look. Group several mini flags in a clear jar so you can see the rustic sticks. 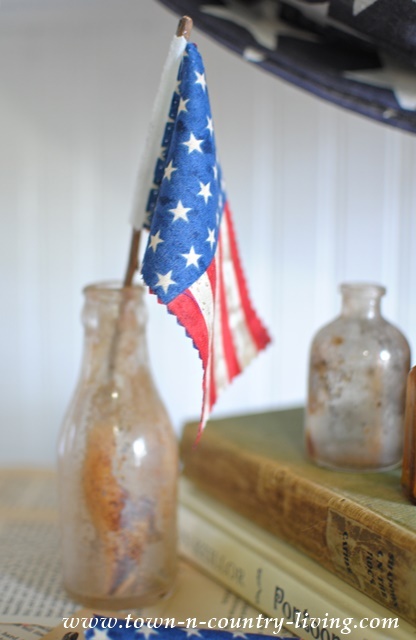 Or use one solo flag in a crusty vase. 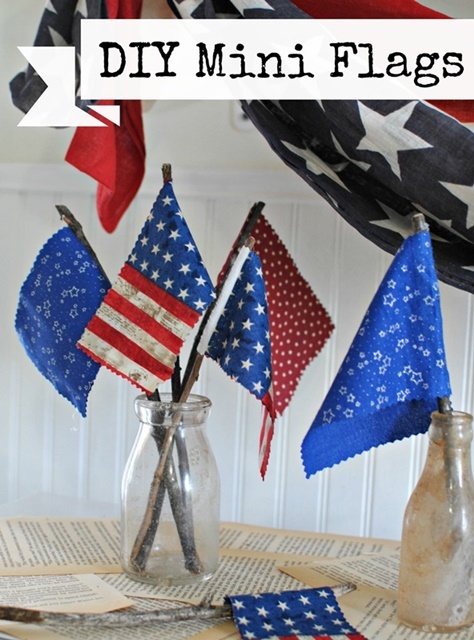 Kids would love playing with these DIY mini flags and you can use them in a variety of ways to decorate your home or a party for the 4th of July. 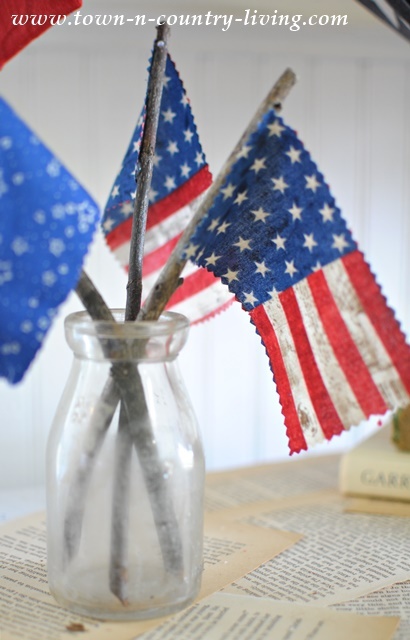 Be sure to visit the rest of the No-Sew Patriotic projects from my inspiring friends! Just click on the pictures below to see what they have in store for you. Enjoy!! These are precious! Now I know what to do with the left over fabric from my wreath. Thanks for the inspiration! Jennifer these little flags are such a great idea! We have lots of sticks and twigs around here too. These will fit in perfectly with my farmhouse style… just like it does your! Happy Flag Day!!!! HUGS! I LOVE these flags! Thanks for sharing Jennifer! These are just perfect! I am going to have to make some of these. Would even be a great craft for the kids. Thanks for sharing.